You must be a member of the New York Connect Group to attend this activity. Would you like to join this group? Thats right..All day happy hour! Join us for a true Italian experience at this charming union Square gem. Come mix and mingle after a busy Tuesday and unwind with some wine and Italian appetizers with chef Alessandro Pendinelli. 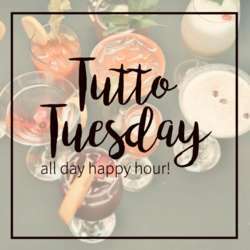 Beer, wine, sangria, and cocktails will be available at happy hour pricing ($ Protected content Tutto Tuesday!